Wholesaler sites in China offer usb faux leather pen flash drives at amazingly low prices. Most are resold on eBay. They are fake capacity. SOSFakeFlash reports not one tested has ever exceeded 8GB genuine capacity for flash memory. Most are between 1GB and 2GB capacity real capacity. 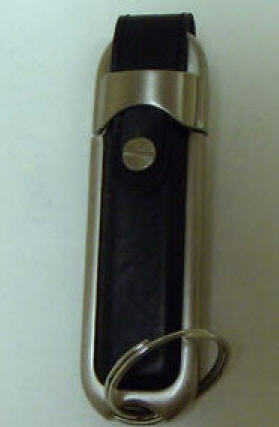 This usb flash drive pen stick is the oldest surviving fake to be sold on eBay, sold for over eight years. Originally the capacity was as low as 256 MB. Currently they contain 2GB or 4GB flash memory storage chips. As the demand for higher capacity increases, the flash drives are manipulated with low level reformatting software to report capacity consumers want. It is one of the easiest models to reprogramme, the usb controller chips old and flawed, easily fooled. The only good news for this ancient fake? It is easy to disassemble and usually contain better quality flash memory chips, worth the effort to restore to real capacity. In 2009, SOSFakeFlash published an interesting article on this leather fake. Complete with step by step tear down in visual photos, the truth is revealed. This guide is useful to buyers who performed capacity testing with the free software H2testw. This fake can be embossed with the brand names of Sony, Samsung and Kingston. Occasionally eBay sellers are foolish enough to have their id stamped on it. The label for capacity is usually a small shinny sticker, very unprofessional for a flash drive, perhaps the first clue the flash drive is a fake. Mostly sold in snap packaging, the card board insert could display Sony Vaio titling. White background with red, blue or green. Less common is Kingston labeling. When not in packaging, Samsung is usually stamped on the leather sleeve or no name at all. Two years later, the only change is advertised capacity. The wholesale cost has not increased. Most of the items offered can be altered to report ANY size to an operating system. The reason? The usb controller chips used. helptony20 eBay seller in the United States, is just one of many offering these fakes. He claimed to have “tested”. At the same time, the flash drives are advertised as unopened and unused. A buy now price of $29.00 is unrealistic for a capacity of 128 Gigabytes. The seller is likely to claim the item is “defective” or “faulty” to buyers reporting failure and disappearance of files. Fortunately this model is easy to open to decode the flash storage chip. An internet search for the flash chip id will reveal the real capacity of the chip before alteration. clearancestore-80 Ebay Fake Flash Memory Seller Alert – Singapore. The Made In Japan Scam For USB Leather Flash Drives. SOSFakeFlash Has Warned You! ← eBay Seller Of Counterfeit SanDisk SDHC Extreme Fake Cards, margarita.marjorie United Kingdom Stopped. Did You Buy From This Seller? Did You Know You Could Report Fraudulent SanDisk eBay Sellers?